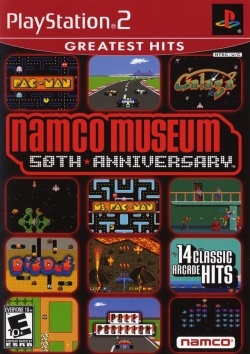 Game description: Namco celebrates their 50th anniversary by packaging 14 of their best classic arcade games onto one disc. The interface lets you browse a virtual game hall with each game shown in its original arcade cabinet. The games included in this collection are: Pac-Man, Ms. Pac-Man, Galaga, Galaxian, Dig Dug, Pole Position, Pole Position II, Rolling Thunder, Rally X, Bosconian, Dragon Spirit, Sky Kid, Xevious, and Mappy. Some editions of the game have the same serial numbers as Namco Museum, although this game uses DVD media while Namco Museum uses CD. This page was last edited on 5 February 2017, at 18:26.